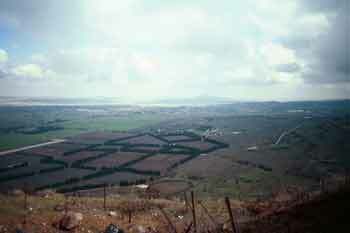 The Golan Heights rise from 400 to 1700 feet in the northeastern section of the country. Israel's highest mountain, Mt. Hermon, is located here. The plateau was once actively volcanic and the northernmost points remain weathered and desolate. The Golan overlooks the Hula Valley, Israel's richest agricultural area. The area of the Golan is roughly 38 miles long and varies in width from 9 to 16 miles (444 square miles). The Banyas River flows through the region and the Yarmuk River separates the Golan from Jordan. The Golan appears to have been used as a cemetery in ancient times. Archaeologists have discovered funerary monuments that are about 4,000 years old. The area was not settled until the days of Herod the Great in the first century B.C.E. During the Ottoman Empire (1517-1917), the Golan was under Syrian administration. When the British defeated the Turks in World War I, they dismantled their empire and, with the French controlled the region. When Syria won its independence in 1946, it regained control of the Golan and, within a few years emptied the region of the sparse population of Bedouin and Druze, and turned it into a military encampment from which to harass Israel. The Golan is a strategically important region, extending like a finger between the borders of Lebanon, Jordan and Syria. In the past, that finger was crucial to preventing the Israeli defense dike from bursting and allowing Arab armies to flood the country. Why? Because it is only about 60 miles -- without major terrain obstacles -- from the western Golan to Haifa and Acre, Israel's industrial heartland. In the hands of a friendly neighbor, the escarpment has little military importance. If controlled by a hostile country, however, the Golan has the potential to again become a strategic nightmare for Israel. From 1948-67, when Syria controlled the Golan Heights, it used the area as a military stronghold from which its troops randomly sniped at Israeli civilians in the Hula Valley below, forcing children living on kibbutzim to sleep in bomb shelters. In addition, many roads in northern Israel could be crossed only after probing by mine-detection vehicles. Israel repeatedly, and unsuccessfully, protested the Syrian bombardments to the UN Mixed Armistice Commission, which was charged with policing the cease-fire, but nothing was done to stop Syria's aggression. Meanwhile, Israel was condemned by the UN when it retaliated. Today, you can visit former Syrian bunkers to see the view their gunners enjoyed of the valley below. This will give you an appreciation of the strategic value of the Golan that you cannot get without seeing it for yourself. Be sure to stay on the well-worn paths, because old Syrian mine fields remain uncleared beyond them. After the Six-Day War began, the Syrian air force attempted to bomb oil refineries in Haifa. While Israel was fighting in the Sinai and West Bank, Syrian artillery bombarded Israeli forces in the eastern Galilee, and armored units fired on villages in the Hula Valley below the Golan Heights. A great view of the Hula Valley is afforded from the Hill of the Twenty-Eight, an old British fortress captured by the Haganah at a cost of 28 lives. When efforts to dynamite the building failed, the group’s commander strapped the dynamite to his back, ignited it, and threw himself at a weak point in the wall. On June 9, 1967, Israel moved against Syrian forces on the Golan. By late afternoon, June 10, Israel was in complete control of the plateau. Israel's seizure of the strategic heights occurred only after 19 years of provocation from Syria, and after unsuccessful efforts to get the international community to act against the aggressors. Six years later, in a surprise attack on Yom Kippur, the Syrians overran the Golan Heights before being repulsed by Israeli counterattacks. After the war, Syria signed a disengagement agreement that left the Golan in Israel's hands. Israel returned the city of Kuneitra to Syria, and a UN-patrolled buffer zone was created between the two armies. On December 14, 1981, the Knesset voted to annex the Golan Heights. The statute extended Israeli civilian law and administration to the residents of the Golan, replacing the military authority that had ruled the area since 1967. U.S. officials have persistently and unsuccessfully tried to mediate a final peace agreement between Israel and Syria. Today, as the peace process with the Palestinians progresses, there is new hope that negotiations with Syria will bear fruit. After Israel annexed the Golan, the Druze living in five villages in the north were given the choice of becoming citizens. Many accepted the offer, but some chose to be recognized as "Syrians abroad." The Israeli government has made a conscious effort to encourage Jews to settle in the Golan, but the majority of the population remains non-Jewish. Several kibbutzim are located in the region. If you follow the main road, Route 98 to the end, past the fields and orchards of the Jewish farmers, you'll reach the border. Actually, the borders between Israel and Syria remain subject for negotiation, so the two countries are separated by a demilitarized zone patrolled by the U.N. Disengagement Observer Force (UNDOF). In that zone is the deserted city of Kuneitra, which lies in the "Valley of Tears" where one of the bloodiest battles of the Yom Kippur War was fought. A great lookout to see the Heights, and especially the Syrian side of the border, is from the now abandoned Israeli bunker 4,000 feet (1,200 m.) above sea level on Mount Bental. You can walk underground and see what accommodations were like for the soldiers manning the outpost. Another good place to view the Golan is from the former Syrian fortification at the Golani Look-Out Post (Mizpe Golani) at Tel Faher. A far more scenic and fun place to visit is the Banyas Springs Nature Reserve. The Banyas is another source of the Jordan River. The area was first settled around the 3rd century B.C.E. and, during the year 2 B.C.E., became the capital of a Roman kingdom. The town later became an important Christian center and is referred to in the New Testament as the place where Jesus determined that Peter would be "the rock" on which the church would be built. The name is derived from the Greek Paneas, (after the god of fertility, Pan). Since Arabic doesn't have a "p" sound, it was changed to Banyas in Arabic. Today, the Banyas are a great place to hike to see waterfalls and to go river rafting. In the center of the Golan is Katzrin, a government-planned town where many army officers stationed in the area settled. The town has an interesting museum of regional history. It is also the site of an ancient synagogue that is particularly interesting because the entrance faces north rather than south as in the typical synagogue. Also, nearby is a winery where you can sample some of the best Israeli wines. About six miles from Katzrin is another of the fascinating strongholds of early Jewish history. 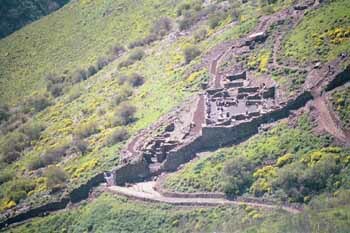 Gamla became home to Jewish refugees fleeing the Romans after the revolt broke out in 66 C.E. The Romans laid siege to the city, whose defenders heroically held out for some time before being overcome. Most of the Jews were killed, though many chose to jump off the cliffs to commit suicide rather than be captured. Gamla derived its name from gamal (Hebrew for camel), since it was situated on a hill shaped like a camel's rump. Though Mount Hermon's highest peak is more than 9,000 feet high, the top elevation under Israeli control is Mizpe Shelagim, the "Snow Observatory," at about 7,300 feet (2,224 m.). U.S. observers have a base on the mountain, and both Israel and Syria have observation posts. 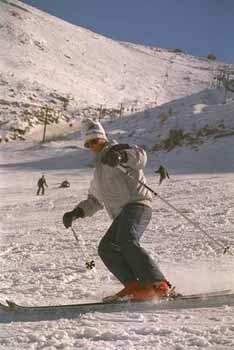 For a really unusual Israel experience, you can try skiing on Mount Hermon during the winter months (roughly December-April). The longest run is more than a mile, but experienced skiers will not mistake the mountain for Aspen. A lift for non-skiers goes to the summit and affords a spectacular view of the surrounding area. A good view of Mount Hermon can be had at Berekhat Ram (Ram Pool), a small, shallow lake in he crater of a dormant volcano. The lake has some fish, which are caught by local Druze fisherman. In the summer, it is also a pleasant recreational area for swimming and picnicking. According to tradition, God made Nimrod lord of all creatures. Nimrod's head swelled with self-importance. He asked why he should sacrifice to God and shot arrows into the sky. God sent the arrows back covered with blood leading Nimrod to believe he had defeated God. But the Lord spoke: "Wicked one, I have a tiny creature down there in my world, a mosquito. Go and do battle with it!" Nimrod went to fight the mosquito, but it flew up his nose to his brain where it buzzed until Nimrod died. To this day, swarms of mosquitoes can be found in the area. Another interesting archaeological site is Mivzar Nimrod, a 12th century Crusader castle that allowed its ruler to control traffic between Lebanon and Tiberias and the Jordan Valley. The fortress exchanged hands between Christians and Muslims for some time and was held for some time by a radical Muslim sect known as the Hashishin. This group was known for smoking hashish and murdering their enemies. The word "assassin" is derived from this sect. Driving through the Golan, you see beautiful mountains, rocky hillsides, green valleys and wild flowers. 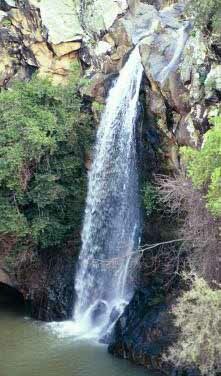 You can also find spectacular waterfalls off the main roads near Gamla and below Nimrod's Castle. Of course the falls are only in full force during winter and early spring; by summer, many of them dry up. The Hula Valley was once a marshland. Israel drained it to eradicate malaria and make room for more people to live and farm after independence. Wildlife once thrived in the area, but the ecosystem was seriously harmed by the effort to make it more habitable. In recent years, Israel has tried to partially reverse the damage by reflooding a small part of the region. Parts of the valley have begun to recover and wildlife is returning. Even this is a mixed blessing, however, as the Israeli desire to promote tourism in the area conflicts with environmentalists' efforts to better protect the area. For now, the Hula Nature Reserve offers places to see birds and other animals. 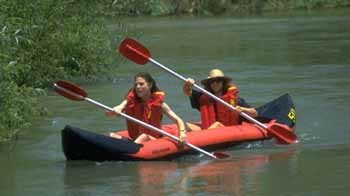 You can also go kayaking nearby in the Jordan River. "It is good to die for our country" -- last words of Joseph Trumpeldor. In the upper Galilee, you'll find a number of interesting towns and villages. The largest is Kiryat Shmona (pop. 18,000). The town takes its name, which means "Town of the Eight," from the heroic Zionist, Joseph Trumpeldor, who, together with seven other defenders, was killed in a last-ditch battle against Arab marauders at the nearby settlement of Tel Hai in 1920. In recent years, Kiryat Shmona has gotten publicity mainly for being a target of katyusha rockets fired from Lebanon by Hezbollah. Israel's northernmost village, at the border of Lebanon and foot of Mt. Hermon, is Metulla. This picturesque town was established in 1896 on land purchased from a Lebanese Christian. Today, approximately 1,100 people live in Metulla, which is known for the Canada Centre where visitors can find squash and basketball courts, a firing range, swimming pool, ice rink and other sports facilities. Just west of the town is the “Good Fence,” a border crossing where some Lebanese are allowed to enter Israel for work and medical care. The crossing's name originated in 1976, when a Lebanese child was allowed to come to Israel for medical treatment. A little more than a mile from Kiryat Shmona is Tel Dan, site of another nature reserve and an important archaeological dig. The city dates back nearly 4,000 years to the days of Canaanite rule. As a border town of the kingdom of Israel along the main trade route between Damascus and the Galilee, and the Dan River, one of the three main sources of the Jordan River, Dan was an important strategic outpost. Consequently, it became a battleground between Israelite forces and invaders from the north, such as the Assyrians. Today, the area is a nature reserve filled with poplars, eucalyptus, oak, pistachio and many other varieties of trees, ferns and flowers. Nearby Be Ussishkin is a museum that tells the story of the Hula Valley and the Hermon.